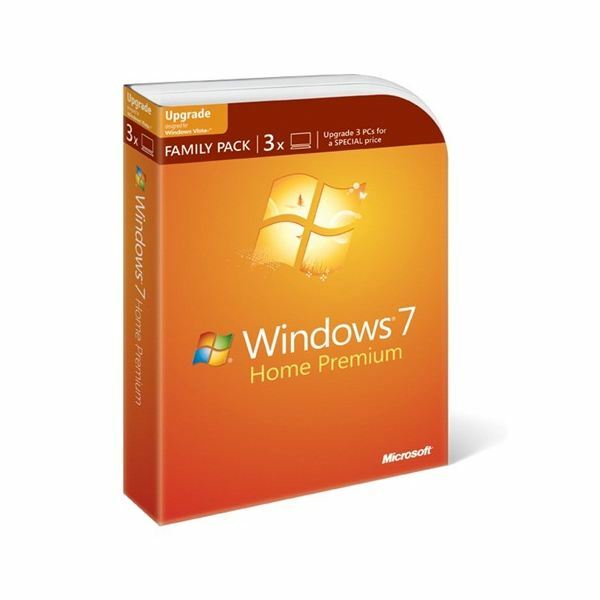 Windows 7 Family Pack Edition - 3 Home Premium Licenses for 149.99! Until now, it has been difficult for home users wishing to buy Windows separately. With a single license for Windows Vista Ultimate going for as much as 400 USD, it’s exhorbitantly expensive for a home user to buy and install multiple licenses for each computer. For example, if you wanted to run Windows Vista Home Premium on 3 computers in your house, you’d have to pay 3 times the cost of a Windows Vista Home Premium license which retails at around 260 USD. While buying a computer with Windows preinstalled is much more cheaper, not everyone will want to upgrade to a new computer, especially if the said user has upgraded one recently. And not everyone will be eager to buy multiple new computers every time a new Windows version comes out. This pushes people towards piracy which hurts the software company even more. Finally, with Windows 7, Microsoft seems to have realised this fact and is offering an amazing deal on the soon-to-be-released Windows 7. With Windows 7, Microsoft has been doing a lot of right things and getting a lot of good publicity. In my opinion, it is what Windows Vista should’ve been all along. It is simply Windows Vista done right! However, with every new Operating System, Microsoft tends to charge anywhere from 100 USD to 400 USD depending on the SKU/Edition. With many people having experienced Windows Vista blunders first-hand, it was a no-brainer to offer some sort of deal to pull people towards the new Windows version. Rumours had been circulating for quite a while that Microsoft was interested in having a Windows 7 family pack edition. This edition would allow multiple computers in a household to be upgraded to Windows 7 at a much lesser cost. Finally, a few weeks ago, Microsoft announced that they would be releasing a Family Pack edition of Windows 7 which could be installed on a maximum of 3 computers and priced it at a mouth-watering 149 USD. The Family Pack of Windows 7 allows users to upgrade upto 3 PCs to the Home Premium edition. Refer to an earlier article of mine here to know more about the different Windows 7 versions that will be available at launch. With this deal, a single license of Windows 7 Home Premium comes to around 50 USD, much less than 199.99 USD for a full version or 119.99 USD for an upgrade version of the same Operating System. And with the Home Premium replacing Ultimate as the best choice for a home computer, the Family Pack of Windows 7 offers the most bang for the buck. This iteration of Windows 7 Home Premium will have the same type of feature-set as Windows Vista Home Premium. Targeted at the home segment, it will be focused toward home and media use. A list of missing features as compared to the Professional version include the following: Encrypting Filesystem, ability to participate in a Windows Server domain, acting as Remote Desktop host, Presentation mode, Location aware printing, Bitlocker drive encryption, Applocker, DirectAccess, Branchcache Distributed Cache, Multilingual User Interface pack, and Virtual Hard Disk booting. While Microsoft has not announced a deadline for the Family Pack offer, the press release for the Family Pack states that it will be available from the 22nd of September until supplies last. So make sure you grab it before it’s off the shelves!